But I don’t think it’s particularly helpful for a celebrity doctor to remind us to take care of ourselves. It’s like telling someone wandering in the desert to be sure to drink plenty of water. It just becomes another impossible standard against which we’re bound to fail. There’s a self-care cottage industry off of which lots of folks are selling books, magazines, politics, religion, and whatever else by perpetrating the “Do-It-Yourself” myth that we are each of us, alone, in charge of and responsible for ourselves and only ourselves. The daughterhood experience feels like DIY on steroids. Caregivers are overwhelmed, doing a lot of hard work all by themselves. It’s easy for all of us to buy into the notion that this is how it’s supposed to be. You better pull yourself up by your bootstraps because that’s all you’ve got. But let’s consider an alternative. What would it be like if we could take care of each other in an interdependent web? 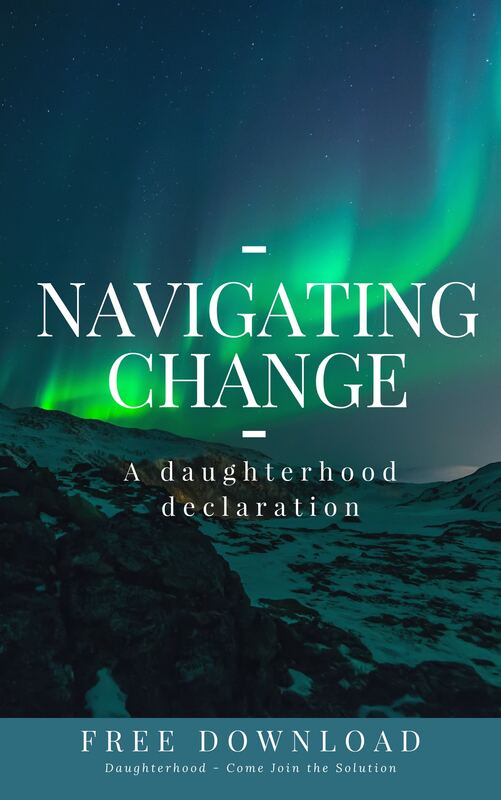 Communities that provide support through meeting places and groups where we can connect with other daughters (and sons). Financial support for adult day care and home care. Employers who understand and see themselves as part of the solution rather than being part of the problem. So, the next time you feel like a failure, just remember: you’re doing a job that a strong social and community-based fabric is supposed to support. And instead of feeling like a failure, maybe just get a little mad that you’re doing it all alone. But now that I’ve had my say about that, I’m going to indulge in a little self-help talk here. Rather than putting pressure on ourselves to take a break we can’t take, how about if we all just get really good at practicing extreme imperfection. Could this be the ultimate act of self-care? Lately I’ve been obsessed by geniuses — great artists, musicians, writers, scientists, and what fuels their huge creative output and productivity. What’s really surprised me is that none of them were given any kind of smooth pathway to get their work done. These folks suffered. They got really tired. They were ignored. They were alcoholics, depressives and insomniacs. They had failed marriages, difficult children, chronic illness, fatigue. Yet, they went ahead anyway and did their thing. They got it done. Despite life’s imperfections – or maybe because of them, their lives became something beautiful. In other words, they didn’t glide through life drinking tea, taking naps and rising for 5 am yoga. They just slogged through and got their work done. There is, in fact, great valor in slogging. We’re slogging through the overwhelm everyday. But we’re getting it done. We ARE creating better lives for the people we love, despite the fatigue, despite the insecurities and long to do lists. Despite changing your Dad’s diaper twice a night. Despite the longing for retreat – for a quiet corner and a book. But, we don’t retreat. And, this is no small thing. This is something big. When a girlfriend and I were marveling at the challenges of parenting with post-partum depression (we both had it), we had a term for the feeling we had much of the time: “white-knuckling it.” But she said something that really buoyed me: A “white-knuckle” mom is still a really damn good mom. So don’t let the self-care experts dupe you into thinking there’s another thing you need to do to be better. Because even though it doesn’t feel like it, if you are slogging through life, you are succeeding wildly at it. Despite what our consumer culture would like to sell you, we aren’t promised good health in this life. We aren’t guaranteed any kind of feeling good. The expectation that you are will kill you a lot faster than sleepless nights. Friends, in the end, what we most need and are missing is the support of each other, and our communities. If Arianna Huffington and her posse could focus on making sure we have health insurance, job security, and adequate funding for community centers and meals on wheels, we’d all sleep a little better. Interesting blog. I hear what you are saying. I spent years caring for a sick child then for the last 20 have had serious heart issues. I tried the slogging – part time work to help with the bills looking out for two parents one with dementia/alzheimers and another with Parkinsons. Now for two years I have to care as best I can for my mother who has Alzheimer’s. I used to paint and sell a bit but due to my own health issues and visits to hospital for myself not to mention my mum, the teeny bit of me left has to be in helping my mother. Also trying to maintain a marriage which is fairly strong but now we are so physically and mentally worn out we struggle to have the chance to be a couple. I’m now at a point where selfishly all I need is total peace and calm with laughter thrown in. The deluge of leaflets just clog up the house they do nothing to help. All the info they contain I’ve been dealing with already. Cuts in the uk mean there is little or no back up support I don’t know what it’s like in America. Celebrity doctors telling one how to cope how to sleep eat exercise generalise. We are all individuals with our own issues we aren’t all fit or have enough money for gyms etc. Everyone is unique we are not machines, so I say do what is right for you, don’t do what others keep saying you should be doing, go day by day. Illness. Being a carer these are not life style choices. One thing that is NOT addressed is the feeling of bereavment and the stages of grief with a parent with a non curable illness. So I say do what you can, learn NOT to beat yourself up. Listen to your body, your gut instinct. Thank you Anne for this page we daughters need it. Karen, thank you for your comments and sharing your story. Although it’s very hard to hear all you’re going through your courage and resilience is SO evident. Please know that you’re not alone and that your trying to find a sense of “peace and calm with laughter thrown in” is survival not selfish at all. Please stay in touch and connected with our community. This really makes me want to cry (not helpful). With the death of my disabled and demented sister last summer, I now only have the paperwork and legal aftermath to deal with–not the regular daily and weekly have-tos and want-tos. But I am still left with the feeling that I should have done more and better and more graciously. I really did a decent job and for 17 years–not so hard until the last 5 when she was in the nursing home. But we are all only a stroke away from starting the care cycle again, so I’m never totally free of the cloud of “might happen.” So the new budget cuts and you are on your own attitudes in the executive and legislative branches are a heavy hit. And, of course, it’s pouring rain today and that affects my mood. But I did want to say that a friend gave me the link to this community and I have read and printed out and pondered your blogs over the last year or two and found them encouraging and useful. And I have passed the link on to women in similar (well, they are all unique) situations and to counselors in the field. Keep fighting the good fight. I have always fallen on the side of Martha rather than Mary, but I think we all need a bit more Mary in us–concentrating on the one important thing rather than all the subsidiary perfection requirements. Thank you for the work you are doing. This is all so true, Anne. I’ve been looking at getting more help, and it’s hard not to feel like there’s something wrong with you if you can’t get everything done. 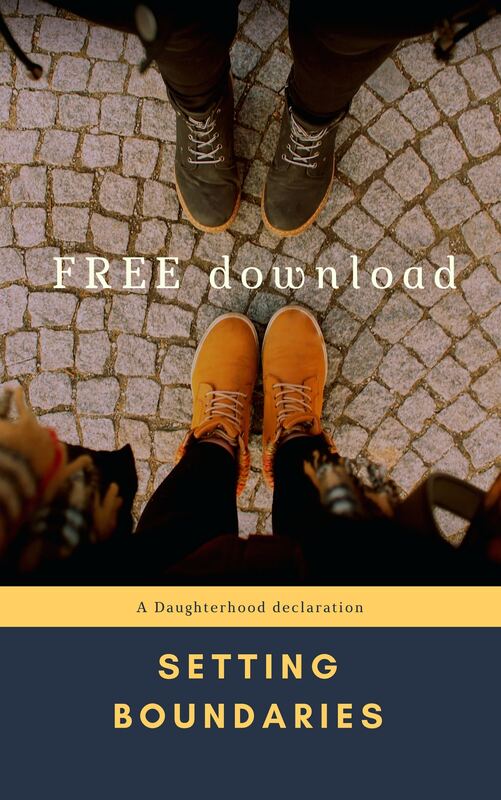 As always, I am a huge fan of how you think and the path you are choosing in an attempt to give us daughters even the smallest bit of relief and support. As a brand new graduate of a masters program in social work, self-care was ALL the talk. I am deluged by emails and television shows, ads, tweets and IG followers reminding me to eat right, exercise, meditate (scoff, scoff) because, in order to help others, you have to help yourself first. Well, DUH. But in the scheme of things, helping others is what keeps me going, it’s what I do and who I am. This isn’t everyone’s career path but it can still become who we are as mothers, daughters, and spouses. Yesterday as I spent two hours convincing my uncle in rehab that choosing hospice care was the only way he would ever get to come home again due to his insane noncompliance, then take my mother, who has dementia, to lunch and the grocery store, pickied up two children from school, took one to gymnastics, ran to the pet store, came home to make dinner, help with homework, fold and put away the laundry I started in the morning and finally put everyone to bed for the night I was EXHAUSTED! And I didn’t even go to work!! You know what I did? I drank a glass of wine and watched Fixer Upper….because that’s all I was capable of, and that’s ok. We need to work on being ok with doing the best we can. Thanks for your blog, Anne. Betsy, Thanks for your comment. I’m also a fan of how you think 🙂 You’re another women who’s earning her masters degree in slogging through. Of course I’m joking but in truth your ability to balance and simply get through a day packed so tight it’s bursting at the seams takes a lot of practice and skill. BTW You nailed it – being ok with doing the best we can. Easy to say but a lifetime learning to do. roles and none of them perfect. Lowering our expectations takes practice, and asking for help is hard to do. Thanks for the support offered through this blog! Anne, You are articulating what I have never had the words to say. “Remember to take care of yourself!” Bah! What a crock! When, when do I do that? And, my mom (feisty AD patient) went from living independently, to skilled nursing to assisted living. I have never had to change her diaper, much less her linens. However, the 16 phone calls a day, untangling her financial fiascos, keeping her friends and neighbors in the loop (or them doing the same for me), communications with her doctor, taking care of her local property, paying her bills, chasing away the charities, deep worrying over her driving (now no longer a concern), keeping (or trying) her mind untangled…All exhausting. And then she totaled two cars in ten days and both of our lives changed. Hers permenantly, and mine for 5 months. She is now in assisted living where she should have been 4 years ago. Her needs are met and she is socially and emotionally engaged rather than being isolated and lonely, living a routine driven life on a small island in the country. I have been ill 4 time this year (once landing me in the ER) as I’ve slogged through the work that needed doing to get her off an island she didn’t want to leave, and get a property leased that still had 1000’s of items in it. What it takes to go through what is only part of your parent’s estate (while they are still alive) is Hurculean and overwhealming. And I’ve got it good! My mom has plenty of financial resources. While I have always worked, my mother’s needs have made it so that I can’t work more than very, very part time (self-employed), and we can afford that. I have a good support system in my children and husband. I am, 2017 aside, healthy. It is still overwhelming. And I still smile slightly crooked at the well meaning folks who tell me to take care of myself. As of May first, things are a little lighter and I find myself weeding and walking. A sure sign that time is easing up a little, but you won’t find me at the 5am yoga class… I’ll be snoozing at 5am. Perfect. I have been feeling like I keep making little mistakes on my parents’ finance upkeep and I berate myself for it, feel overwhelmed and the mistakes mean more work so more overwhelm. And so on. I have a new grandbaby I am supposed to visit next week and that provides another sense of overwhelm albeit joyous. Then I got an email from Karen van Dyke asking if I was coming to the next Daughterhood meeting. When I realized it was the night I was leaving for the grandbaby visit, I felt torn. Then I thought, you know, I’m not perfect, even at being a grandmother. So I moved my date of my flight to a day later and chose Daughterhood instead. I needed to go be among others who know we can’t do everything and definitely not everything perfectly. This post just proves I did at least one thing right–thought of myself. If my dad doesn’t get the greenhouse I ordered before my brother arrives to help him put it together because I put the wrong phone number on the order, then that’s just how it goes. Life. I’m not perfect and neither is it. Thanks for being here to remind us. Amy, Thanks for you comments. Ahh…little mistakes 🙂 . You describe the “circle of overwhelm” perfectly. And I laud your decision to change your schedule so you can attend your Daughterhood Circle meeting. Being with others who get it is a great the way to handle overwhelm! What a breath of fresh air! I feel that I have been given permission to lower my high standards and relax a little. Thank you. How refreshing you put your initial direction aside and followed your gut. I relate to you and your message. Thank you for putting your cards face up on the table. Exactly what I’ve been feeling this week. I used to meditate twice daily, exercise regularly, attend a yoga class weekly, take peaceful and invigorating walks through my seaside village, read books and attend personal growth workshops, eat a very healthy diet…all while maintaining a full time job, a few close friendships, socializing with extended family and helping my mom with her health appointments and finances. For the past three years I’ve been basically living with her – first to help her while recuperating from a hip replacement surgery, which became permanent when she was diagnosed with Parkinson’s, scoliosis, spinal stenosis and neuropathy. She needs help with dressing, bathing, bathroom, transfers, hygiene, and sometimes eating. She is unsteady when she is walking with her walker and I always need to be by her in case she loses her balance. Even with that she has experienced several falls where I just couldn’t prevent them or catch her. I constantly have mood swings where I feel fortunate to be able to give my mom the help she needs, just as she did for me many times in my life, and then I swing to the overwhelm and anger for not having help from extended family members, and then to guilt for feeling the way I do. I am basically on call from the time my mom wakes up until she goes to sleep…and during the night as well if she awakens and needs to go to the bathroom and wants a drink of water. The only time I take for myself is after she goes to sleep…I stay up late to read or watch some favorite TV programs that I’ve DVR’d. I tell myself I should go to sleep when she does to get my rest, but I justify staying up to have some time to myself. I still have an apartment that I go home to once a month for 2 or 3 days, and hire a 24/7 caregiver to stay with mom at that time. I’m trying to maintain some semblance of my own life but it’s getting a bit ridiculous to maintain an apartment I only use 2 days a month…and financially draining. I guess that’s the only thing I look forward to…to have 2 days where I can do what I want and not have to care for anyone but myself. I’ve been beating myself up about not eating right, not exercising, not getting enough sleep, but I’m doing the best I can under the circumstances. The only other option is to hire a caregiver more often, which can be very expensive. In the state of Connecticut, they have a program that actually pays a family caregiver a stipend, but it only applies to people who qualify for Medicaid. My mom’s assets disqualify her. I’m trying to preserve as much of her savings and investments as I can and keep her home as long as it’s the best for her. I think sometimes she would be better off in a facility where they have social activities and therapy on a consistent basis to provide more stimulation, but I know she would not be comfortable there. I was hoping there would be more involvement from our large, extended Italian family but the only ones who seem to care to call or visit are a handful of relatives, mostly her senior brothers and sisters – it frustrates me that many of my cousins who my mom provided childcare for and financial help over the years have never bothered to check in to see how she’s doing. So much for our close Italian family…and many of these cousins are now retired, no longer working, and in good health. I’ve mentioned how I could use some help now and then, even for a few hours just to be able to go food shopping without having to worry about mom being by herself for a while…but get nothing. Am I the only one who thinks this is odd? The only two people who have offered any help in the past three years are one cousin and one aunt who are not even blood relatives…they married into our family…but now both have their own health problems and are no longer able to help. Sorry for using this comment to vent, but if I don’t get it out I feel I’m going to explode. I probably should start journaling again to get out this frustration…another thing I should be doing. Ha! So, if life is just slogging–well, that’s what it is. But I would hope many people can find some joy. It is sad to see my husband deteriorating, and hard to give him the care he needs, and do the things he used to do. But I am sorry for those who can’t find any joy. He went for blood tests, and I asked what they were for. Well, one was for this and one for that and then there was the special donation for the office’s resident vampire. Extreme imperfection. That is a great summary! I am extremely imperfect and am getting more so. I am glad to hear that I am not the only one who read about not getting enough sleep! One article had me almost convinced that i would develop Alzheimers if i didn’t start sleeping more! I am also overwhelmed and dont know where to turn. My dad passed away 2 years ago and it has been downhill since then. Looking back, I truly believe that my mom’s dementia had alreadymstarted to take hold. Perhaps myndas knew and said “i,m getting the hell out of here while i can. Mom obsessed over everything after he passed……but i have never seen her really grieve. Right after his passing, on my twondays off from work, i would leave my husband and our 2 cats qnd drive to moms house 3.5 hours away. I would spend my days off with her, drive staright to work from there and see my husband and cats during the work week. I did this for about 6 months. I noticed a difference in her personality and organizational skills but chalked it off to my dad’s passing. The next year i cut back to driving up there every other week so i could salvage my marriage and get some rest. I called her every day. We were on an outing one day and that’s when i really noticed something was wrong. We went shopping, and when it was time to pay, mom had an odd look on her face, and once she found her credit card, she couldn’t figure out how to swipe it. She yelled at me when i tried to help and i watched her as the cashier showed her how to swipe her card. This woman loved to shop and had never had a problem swiping her card. That night at dinner, she couldn’t decide on what she wanted, and then said one thing, pointed at another and then asked me what she wanted. I went to her next doctor’s appt with her, spoke with him, and he chalked it up to depression. 6 months later she fell in her house, broke her femur and wound up with extreme delirium in the hospital. She then went to a rehab facility for 3 months. The delirium subsided but the dementia increased. Another 3 months making that drive and spending all my days off at the rehab center. They released mom, in my care, to go home. They prescribed pt, ot and skilled nursing visits. I took unpaid FMLA from work. After mom had all the therapy she could get through Medicare, she was informed that she was not safe to stay at home by herself. She agreed to come stay with myself, husband and 2 cats at our apartment. And the sweetest dog in the world came with her. It has been a difficult adjustment, for all of us. My mom asks i have had a few verbal arguments……and it seems to be getting worse as her dementia gets worse. She’s at that stage where she still wants to go home, knows she can’t live alone, and has to be reminded there’s not enough money, not will Medicare pay, for 24 hour care. She’s still paying for her house, car, etc (well, i make those payments but with her income). The last 2 months she seems to have gotten worse, but who knows? It got to a point where she would get up when i was heading to work and start in on me about why i wouldn’t let her go home, why i spent all her money and that she knew i stole her house and what little money she had. I just finally became so overwhelmed, I gave notice at my job, got something part-time in order to stay more with Mom. Well, then she had a few crazy spells when i would just go out for a couple of hours. One time she disconnected her oxygen tubing from the machine (i came home and she was saying she didn’t know why she couldn’t breathe). Another time she had a bowel accident (i came home, she was sitting on the couch crying with poo coming out of her diaper, onto the couch, and on the pillow she used to try to catch the rest of her poo). Needless to say, no part- time job for me. So now, i am even more overwhelmed. I need at least part-time income to pay bills. There is enough money for me to be off one more month and that’s it. How am i going to ever get through this? Some days I’m sure we’ll be fine, but a lot, I’m not so sure. Some days she knows who i am and seems almost a version of her previous self… and other days she doesn’t know who i am and thinks she’s renting a room somewhere. So i sit here, so many thoughts on my mind, wondering who or where i can turn. And that doctor who said she was just “depressed”, well, he now has said to me that she has “moderate stage” dementia, and tells my mom that “she’s just a little forgetful”. I don’t even know what type of dementia she has, or how long she’s had it. Thank you for letting me vent, and any advice will be helpful. In the meantime, i will just keep slogging along and doing the best that i can. Fellow slogger, putting on my big girl pants every day. The rewards are internal. We do the best we can and we do it because we know its the right thing to do. No awards or accolades. Its just life, and the old fashioned putting one foot in front of the other while rising to hope for the best. God help the one that gets in my way. So true! Was just thinking last night how I was going to make time for exercise. HA! Self care is important but sometimes other priorities take place. Thanks for being a voice of reason in a whirlwind of insanity. Applause! Beautifully written. You’ve described my life for many years now in a way that makes me smile, slogging and all! I am doing ALL that you have described for a parent with very advanced Alzheimer’s. This is my 2nd round as a caregiver – first round was for my late husband. I am a widow, also raising a teenager and have no family within a days drive. Little money and no insurance of my own as I can’t work – can’t even leave the room unless she’s in adult daycare. Finding time to give myself a shower, or even read an article can be a major achievement while the one you are caring for is sick, uncooperative, doesn’t understand most words you try to use, becomes combative, and is still in good physical shape so is highly mobile and mischievous! Lol! Yes, I slog through. And it seems no one has understood, really. I have only 1 friend who has endured my not being able to talk or go or plan because my life has been swallowed up for the time being. Most people seem to actually look down in a condescending manner when I try to explain. Self-esteem has taken a beating! Thank you so much for for this article. It is so refreshing to know someone really gets it and acknowledges that we are doing the very best we can, and sometimes “slogging” is an Olympic level achievement! Your article also inspires me. I started writing a novel 5 years ago in March when I still had occasional moments when I could take time to write or to edit/ transcribe for others for income while caring for mother. That partial freedom didn’t last long. Now I give up precious sleep time to be able to jot a note down, read an article, or anything at all for myself. Some nights even that is impossible as she gets up again and again refusing to sleep. Still, I have not completely given up. Somehow, someday, all those post it notes and sporadic thoughts will finally come together into a coherent theme, and I will finally birth the novel brewing and stewing within my heart. That, to me, is even more challenging than exercising, finding time to sleep, being able to meditate, or any of the other things I so desire. Slogging is Good! Slogging is movement of heart, mind, and body. And by slogging I will be and do and become and continue to grow. Patience, character, endurance, courage, and a heart capacity for greater love are being birthed by slogging, and once born, will be expressed with greater depth and purpose than I could have ever known had I not had these experiences. Thank you again for this wonderful article and all you are doing for so many through your website! You are awesome!